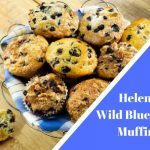 Today's recipe Helen's Wild Blueberry Muffins was one of winning entries at the recent Dundas Plowing Match & Agriculture Fair. In a separate bowl combine salt, flour and baking powder. Combine with the sugar, butter and eggs mixture and add milk. Fold in the blueberries being careful not to over mix. Fill greased muffin tins half full. Sprinkle tops of muffin with sugar and bake for 20 minutes. Makes 15 muffins. Special Thanks to Helen Jackson.